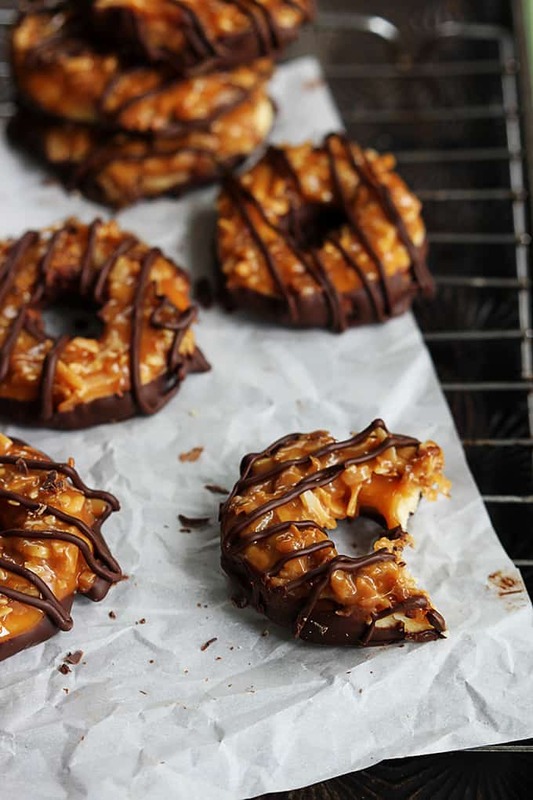 Whip up a batch of your favorite coconut and caramel Samoas girl scout cookies at home!! Even BETTER than the originals! Samoas are by far my absolute favorite girl scout cookie. Like, without a doubt. I know there are a lot of Thin Mint lovers out there, and I can respect that chocolate-mint combo, sometimes you just gotta have it. 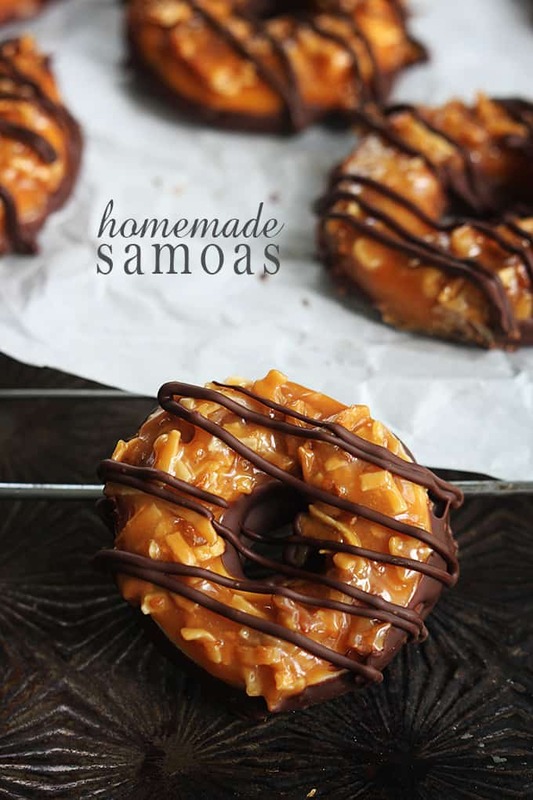 But for me, Samoas are hands down the must delicious little round pieces of perfection on the entire planet. It’s a match made in heaven. Me + caramel + coconut + chocolate. I’ve been dying to make these at home for months. Why I haven’t before now is, well, dumb. . . to put it nicely. I guess I was being lazy? But there was no need for laziness. These cookies are ultra easy to make. Which is good for impatient, 20 pairs of sweats owning people like myself. And I wondered if I’d catch flack for saying this but, ah what the heck – I’ve gotta be honest: these are better than the originals. Unspeakable! No but really, it’s true. 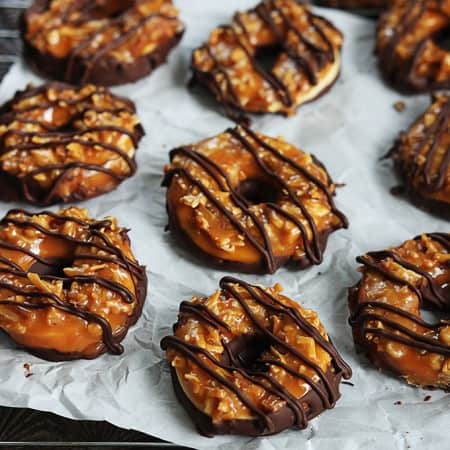 The caramel stays soft just like it should, the cookies is buttery and vanilla-y and totally delicious, the coconut-caramel topping is piled high to heaven, and the chocolate is extra-rich. Ohhhh yeah baby. But beware: upping the richness in these cuties just makes them even more addictive. I just made them yesterday and I have 3 left. Mind you there are only two of us living in this house. And my husband doesn’t like coconut soooo…..
To prepare the cookies, whisk together flour, baking powder, and salt and set aside. Mix together butter and sugar in a separate bowl until fluffy. Add flour and mix with until fine crumbs form. Add milk and vanilla and continue to mix until dough comes together. Flatten the dough slightly, wrap it in plastic wrap, and chill for 1 hour OR freeze for 20 minutes. Use a round cookie cutter to cut as many cookies as you can from the dough. Cut the centers out with a smaller cookie cutter. (*see note for alternative method) Place each cookie onto a greased baking sheet. Press the remaining dough into a ball, roll into a 1/4 inch disc again and repeat cutting process. Do this again until you have used as much of the dough as you can. Bake cookies at 350 for 10-12 minutes until cookies look "dry" and very slightly golden in color. Place cookies (on a baking sheet) in the fridge or freezer. In a medium pan over medium heat, continually stir coconut flakes until lightly browned (about 3-5 minutes). Set toasted coconut flakes aside. In a microwave safe bowl, combine caramels and heavy cream and microwave on high 2 minutes. Stir, and return to microwave for 20 seconds at a time, stirring between each, until caramel is fully melted and smooth. Stir in salt and vanilla. Spread about 1-2 teaspoons of caramel on top of each shortbread cookie. Chill for 2-3 minutes to let the caramel set. Stir coconut flakes into remaining caramel. Spread coconut-caramel mixture onto each cookie. Chill again while you prepare the chocolate. Add chocolate chips to a microwave safe bowl. Microwave on medium power for 2 minutes. Stir, then return to microwave for 20 seconds at a time, stirring between each, until fully melted and smooth. Carefully dip each cookie in the melted chocolate so that the bottom is well-coated. After all cookies have been dipped, drizzle remaining chocolate over the cookies. Store in an airtight container or ziplock bag chilled or at room temperature up to 1 week. *if you don't have two cookie cutters in the side and shape you need for these cookies, you can use clean jar lids and spice caps to cut the dough into circles. Recipe adapted from Just A Taste —> p.s. this link will take you to some really awesome step by step photos in case you need them! More Dessert Recipes you'll enjoy! I’m dying to try these! I’ve been wanting to make them but was thinking they were too hard as well. They look so perfect! I used to love these girl scout cookies! 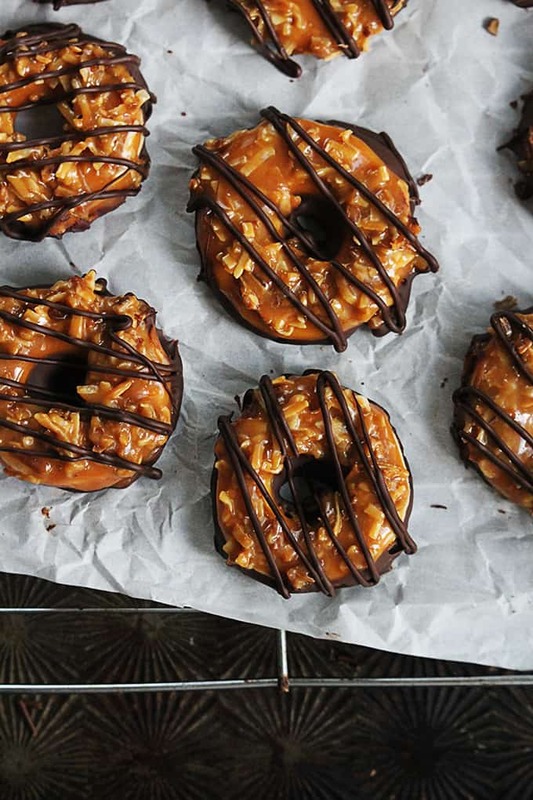 Though I was always more of a thin mint girl, the samoas were very addicting as well. How great they can be had at any time of the year, not just during girl scout season! Keep up the awesome recipes! Love the blog! My favourite kin of cookie! What more could you want! Those look awesome! You did such a great job recreating them! YUM! I’m so glad we can eat these year round now (even though my skinny jeans say otherwise). They’re beautiful and I know they’ll be awesome! Oh my sweat pants have already made an appearance after eating um….. like 15 of these! hahaha, too good to resist! I found that melting chocolate chips in the microwave just burned the chocolate and ended up wasting a full bag! So I’m headed to the store to her chocolate bark which seems to work better for me! 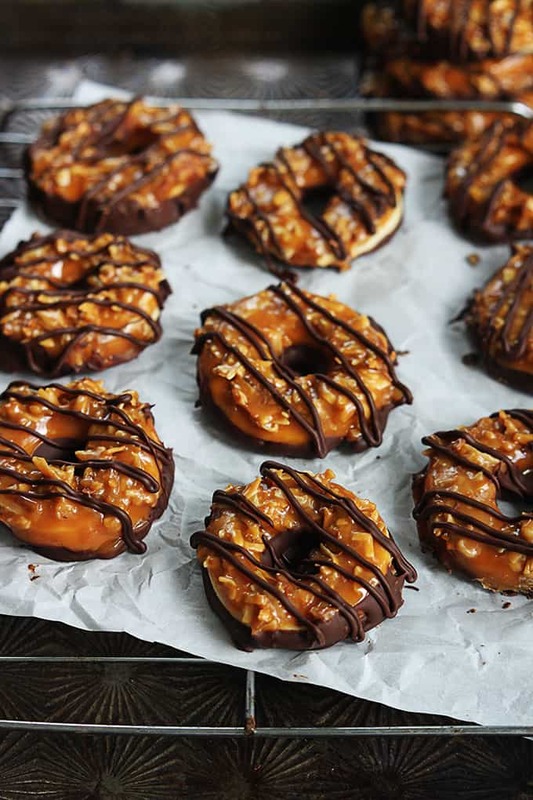 Do you think I could just make some caramel instead of melting the candies? Or would I have to be a caramel master to make sure it wouldn’t be too runny? I intend on sending the cookies through the mail.. so they can’t be too gooey.. I don’t have a microwave:/ any suggestions for a stove top method instead? The ingredient list calls for baking powder, but the instructions say baking soda. I went to the original post on Just A Taste and it looks like it’s baking powder that you want, not soda. Just thought I would let you know so others can make the recipe without confusion 🙂 (I’m making them right now and am so excited!) Thank you for the post!! Hey! Your ingredients list says “baking powder,” but the instructions say “baking soda.” Which should we use? Looking forward to trying these!! These look so delicious and easy! Thanks for sharing! I can’t wait to try them myself! Thanks for the recipe. 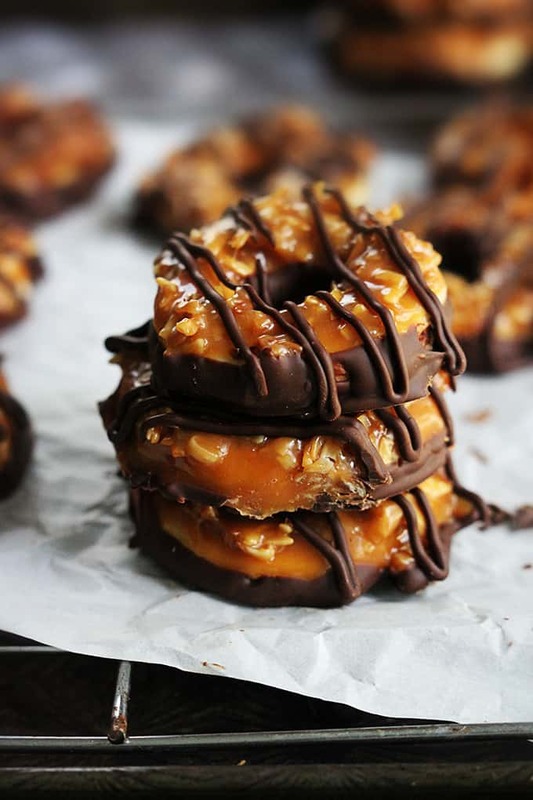 I keep seeing recipes with samoa cookies all over pinterest, but we don’t get them in the UK. Now I’ve seen these, I’ve got to make them!! Made these last night and had to restrain myself from eating every single crumb! It totally inspired me to re-create that smell using my Pink Zebra Sprinkles. I linked to your page off of my Pink Zebra facebook page ( https://www.facebook.com/#!/pages/Pink-Zebra-Independent-Consultant-Kristen-Ward/369455646586133?fref=ts ) so others could find you and your treats along with my recipe for the wax melts. Hope that is ok and everything is going great! Hi Savanna, it’s baking powder – I updated the directions! These were delicious and a HUGE hit at the party I took them too! I did alter the recipe to make bars rather than individual cookies by: pressing the dough into a pan (9×13 because I doubled the recipe), baking at 350 for about 20 minutes, then mixing the toasted coconut with the melted caramel and pouring over the whole pan, chilled, cut into squares, dipped bottoms in chocolate. Even with omitting the rolling and cutting of the cookies, this recipe was pretty time/labor intensive for me. It was worth it because they were really yummy, but will probably only make for special occasions. I made these today and they are delicious but it was an all day task!! I am willing the sacrifice the fun authentic cookie shape for an easier assembly method. I will definitely be trying this pan method, that sounds much easier! I also think I rolled the dough out too thin, some of the cookies were too thin and crisp, not thick enough. I’m so tired of making these now I’m just spreading the chocolate on so I can finally eat them. Thanks for the recipe! Man. did I ever miss the boat on this one….. When did “Some Mores” – become “samoas”?????? Not nearly enough dough for this kind of complicated cookie. I only got 12 out of it. That’s ridiculous. Plus thew dough is too druy and crumbled. I had to add milk. I want to make these ahead of time – do you think they will freeze well? Hi Nicole- I haven’t done that with this particular recipe but I definitely think it would work!! Hi Tiffany, thank you fOr the recipe. I just wanted tO ask you about the CARAMELS. The bag of caramels i bought seem quite hard. ( not hard candy, just not squishable) Since they have to be melted anyway, will it matter? Hi Becky- I think they will turn out alright!! I can’t say for sure tho!